"Box on the Docks events at Docklands"
"Most important Promotion of the Year"
Prestige Sports Management with channel10's broadcast fight night of "SUPERBOXER"
"Eddie Delic vs Shannon McMahon 20th Nov 2009"
"WBF Intercontinental Light Middleweight title fight"
Victor from YVB (left) made the presentation on behalf of his boxing website with assistance from Damian Membrey. YVB thank Damian seen here (right) for helping with the presentation which made it go on smoothly with seemingly little planning. 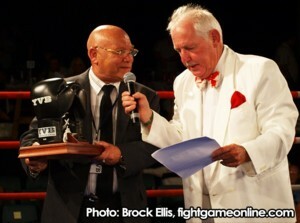 Damian has been a staunch boxing person in helping of organizing the now, low key, Victorian Boxers and Trainers League without Hank Stanley at the rudder. Hank is now taking things easy and enjoying his old age time with less pressure of tasks like this. YVB wish Hank (John) Stanley all their best. 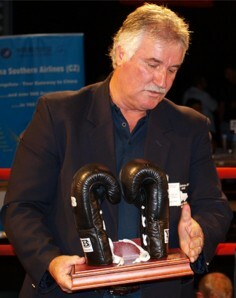 YVB "PROMOTER OF THE YEAR"
Peter Maniatis winner of "YVB Promoter of the Year 2009"
Peter Maniatis was awarded this trophy because of his tireless work promoting boxing in and out of Australia. Peter also equaled all other promoters with his total of events to 5 during the year. 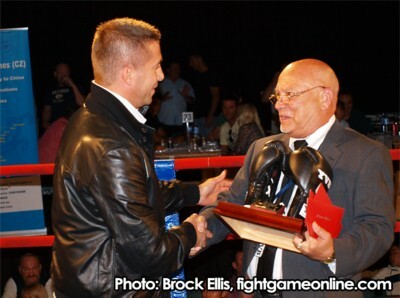 "MOST PRESTIGIOUS PROMOTION OF THE YEAR"
Bernie Balmer receiving award on behalf of Brian Amatruda/Barry Michael Promotions for "Most Prestigious Promotion of the Year 2009" for their fabulous "BOX on the DOCKS" promotions in standards never seen previously in Melbourne. David Deicke receiving the YVB Most Important Promotion of the Year 2009 trophy. David received it also, on behalf of his partner Keith Ellis for Prestige Sports Management. Their SUPERBOXER channel 10's ONE HD was an absolutely great show and it is shameful for channel 10 not to continue these free to air series as they went so well. 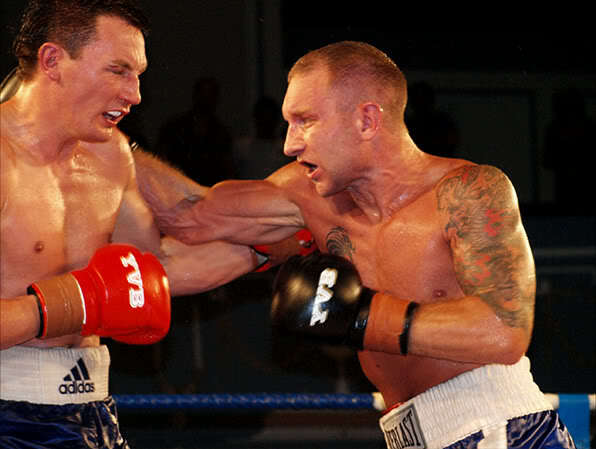 YVB "FIGHT OF THE YEAR"
This page is a follow up of previous presentations made by YVB. 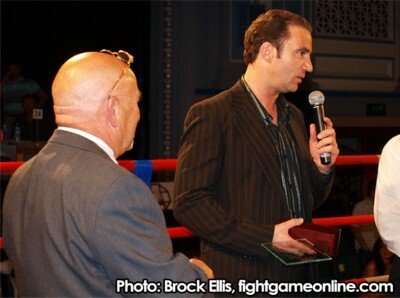 "Most Improved Fighter of the Year"
click VBTL to see previous presentations.